I love checking out all the festival fashion pics on Instagram! One of the constant trends year after year is fringe. 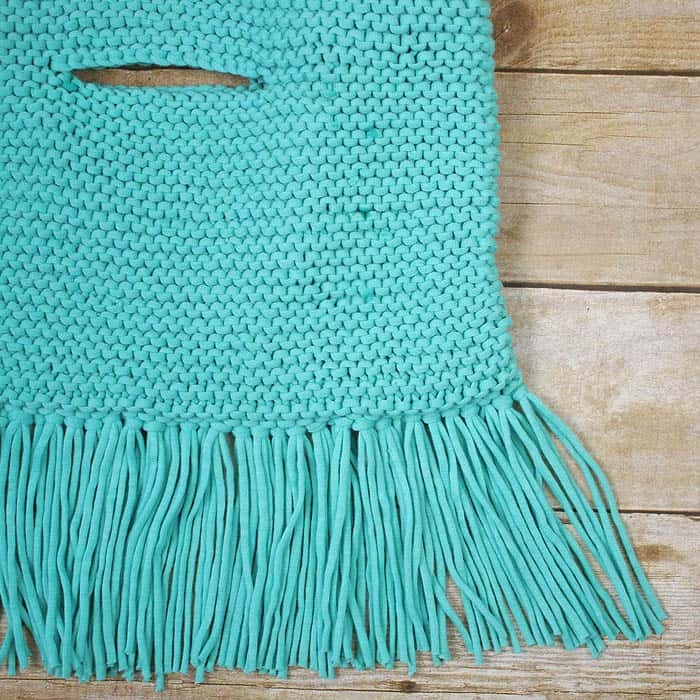 Fringe is playful and fun and it screams “summer!” This fringe clutch knitting pattern is perfect for beginners! 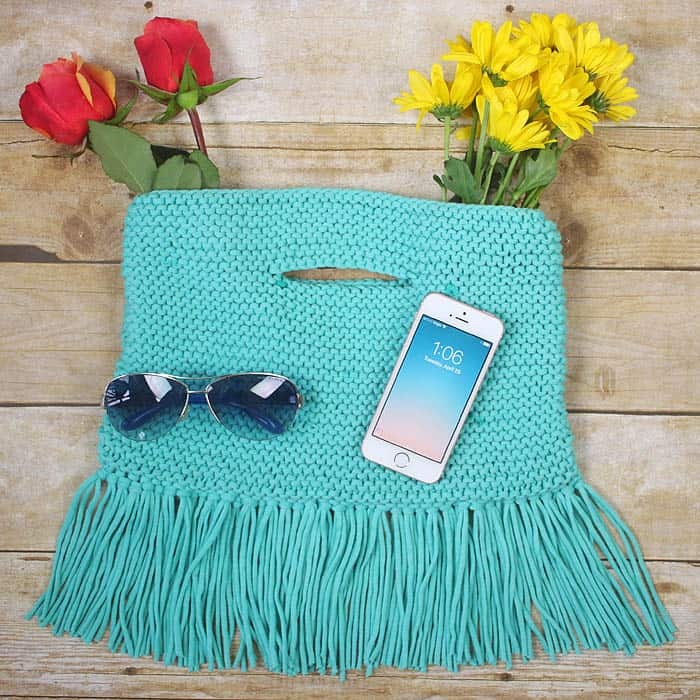 The entire bag is done in knit stitch with some simple binding off for the handles.This clutch would look great with a white sundress or even at the beach. If you haven’t tried this Bernat Home Dec yarn yet, it’s perfect for spring/summer knitting patterns! It’s a cotton and nylon blend and it feels more like fabric than traditional yarn. It’s similar to t-shirt yarn. Also, it knits up thick so it holds its shape well. Happy Knitting! Cast on 46 sts. Work in Garter Stitch for 2 inches. First row: Knit 16, Bind off 14, Knit to the end of the row. Continue working in Garter Stitch until piece measures 14 inches from the cast on edge. Knit for an additional 2 inches and bind off. Cut strands that measure 12 inches long. 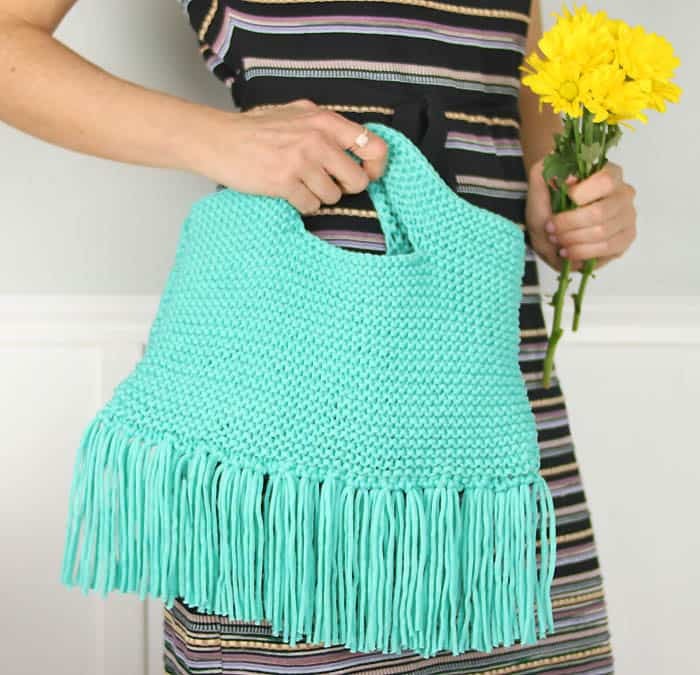 Put 2 together and using a crochet hook, insert through the bottom of the bag. Make a loop, pull through to tighten.